If you have ever been to Bryce Resort during ski season, you probably saw some people in red jackets with white crosses. In those outfits they are hard to miss. They are not showing pride in Switzerland, though they may look like a moving Swiss flag. They are part of the Ski Patrol. Some of them are on downhill skis, but you will also find them on snowboards, cross country skis, snow-shoes, and sometimes just walking around. (In this article skiing refers to all downhill modes.) They seek to help people enjoy the winter environment, be safe, and treat any in-juries that occur. 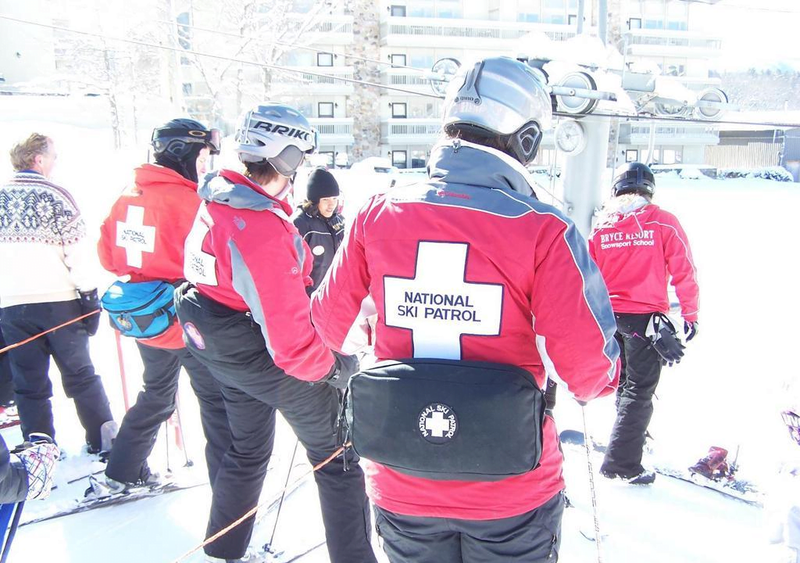 In the United States over 98 percent of patrollers belong to the National Ski Patrol (NSP). There are over 650 NSP patrols found at ski areas, state parks and back country ar-eas—that’s about 30,000 people, counting retired patrollers. In Virginia you find them at all ski areas, including Bryce, and there is a Nordic Patrol serving back country areas in national forests when there is enough snow. Who are these people? How did we get this system? What is the training like? What is the job like? I will try to answer that from a Bryce perspective. I have been a paid pa-troller with NSP credentials for almost twen-ty years. Most of my time has been at Bryce Resort but I also worked at Sol Vista (now Granby Ranch) in Colorado. 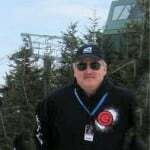 I have trained with patrols at Massanutten and Wintergreen during the last two decades. They are a diverse group of folks, women and men ages 16 and up. They range from students to professional career people (and even a pastor I know of.) Some are volun-teers and some are paid. All receive some compensation for their services (free skiing, discounts on equipment, etc.) All of them have in common a love of skiing, the out-doors, and a willingness to serve others. How did we get this sys-tem? By the post war (WWI) era, immigrants from northern climates had brought ski rac-ing to America and it really caught on in New England during a stretch of cold and snowy winters in the 1930s. A man named Charles Minot “Minnie” Dole got heavily involved in downhill ski racing. In 1936 a friend of his died during a ski race due to injuries from a crash and poor treatment and transportation following his injuries. Dole was convinced that better safety and medical training was needed. He was put in charge of taking the poorly organized and trained medical patrols that existed and cre-ated a ‘super patrol’ for the 1938 National Ski Association championships held near Stowe, Vermont. So successful was this effort that he was charged with creating and overseeing a national patrol. Eighty years is a long time and the NSP has changed to meet new challenges. Origi-nally it was conceived as a group of trained patrollers who would go from place to place, primarily for races. But ski areas be-gan to spring up as more recreational skiers were lured by new technologies (chairlifts, groomed slopes, snowmaking and improved skis) and the number of recreational sites multiplied. Now ski areas run their own pa-trols but most patrollers receive training and re-certification from NSP as a standard with local needs added on. The advent of snowboarding, snow-bik-ing, tubing, and other winter activities have changed the dynamics of the patroller’s job. Advances in medical knowledge and higher expectations for level of care have increased exponentially. (Example: there were no AED defibrillators in 1938.) This kind of training became expected of bike patrols, white water rafting guides, and other groups. Despite the changes of 80 years, “Service and Safety” is still the core value. To be a patroller you must be trained to at least the Outdoor Emergency Care (OEC) medical standard. That is similar to the treat-ment level of an EMT-B. Everyone must have a professional responder level CPR/AED card from a recognized provider. Then you must earn an OEC card. If you already have a valid active medical training of EMT-B or higher (paramedic, nurse, even medical doc-tor) you can ‘challenge’ this status by means of a brief class followed by a written and practical test. For the rest, including me, that meant tak-ing a class of over 80 hours with a written and practical test at the end. Getting an OEC card is just the first step. While a longer EMT class gets into ambulance and service train-ing in a suburban/urban environment, we must learn to treat folks in an outdoor moun-tain setting. Weather, lighting, and changing snow conditions can be a challenge, at even a small mountain like Bryce. We treat these injuries outdoors with limited resources. But that is just the beginning. Then comes what is referred to as “S & T”. That is Skiing and Tobogganing training. A patroller must be able to ski competently all the trails she or he must patrol and do so with a skiing ability that “inspires confidence in the skiing pub-lic.” Those skiing skills are then augmented by the skills necessary to ski a sled (tobog-gan) loaded with supplies. Then you advance to loading the patient and skiing them down the mountain without causing further harm to a patient, yourself, or the skiing public. That is a skill even the best skier needs to practice. New patrollers are assigned to work with veteran patrollers for a while to learn the ropes. One of my first calls was for a patient that had run off a slope; due to another ac-cident I had to handle this case by myself. I had to evaluate, treat (knee injury), load the patient into the sled, and ski him down to the First Aid Room at the base. The patient eas-ily weighed over 250 pounds. I managed all of this with training and technique. Every year patrollers are expected to demonstrate that their skills are up to date. Those skills include: CPR/AED (even if your card does not expire that year); a refresher test covering 1/3 of the OEC curriculum and a ski and toboggan handling evaluation. There are additional refresher and learning techniques covered during the ski (and bike) season. All this is ensures the public receives the best care and safety measures we provide. What is a typical patrolling shift like? There is no typical day, that’s one of pa-trolling’s joys. Each shift is different. It’s also not the glamorous life shown in mov-ies. A ‘normal’ day shift at Bryce would be something like this: After reporting early to review notes from the previous day and the patrol director, you check in with resort management. If paid, you clock in. A check of the medical and transportation equipment follows, as you assume responsibility for it once your shift begins. Then you get your skis ready and boot up. All of this must be accomplished in time to ride up before the public is allowed on the lifts. On your first trip up, you take along signs that must be placed once grooming is com-plete. (These are slow, merge, and caution signs and the rechargeable drill to put them in place.) Working in a group of 2-5 patrol-lers, signs are placed and fence repairs or replacement made as needed. Patrollers then ski each slope, checking off conditions were safe. Any issues are reported to management. By the time you finish these tasks it is usu-ally break or lunch time. Paid patrollers are rained to help run the lifts so the ‘lifties’ can get lunch and necessity breaks. Busy days of-ten find other tasks to assist (ski school, etc.) as management deems proper. If your shift includes the end of the skiing day, closing procedures including a ‘sweep’ of the slopes as patrollers are the last skiers down and equipment is stored. A write-up notes of note for the next shift and patrol director follows. Not for the money, nor the prestige. Again, it is for the love of skiing (or biking), interacting with the public, helping others, and getting outdoors. For me it is also a nice contrast to my ‘day job’. It is also an opportu-nity to develop your skills, because you must ski in all conditions and weather. You don’t get to choose. Some days are better than oth-ers but it is never boring. So, if you go to Bryce (or elsewhere) and see ski patrollers, say hello. When you see us working by the side of a trail, wave as you go by. If we have to talk with you about the rules, please be patient. If we need you to move, or stop, as we treat or transport, please listen. Our goal is still “service and safety.” The Ski Patrol wants to make your experi-ence as positive as possible. If this interests you and you’d like to find out more, call, text, or email Bryce (or your local resort) and leave a note for the Ski Pa-trol Director. If you see me out on the hill, flag me down, and let’s take a run together. Enjoy the winter! Editor’s note: Bill Nabers lives at Bryce Resort and is an ordained Lutheran minister. He has served several congregations mostly in Virginia. 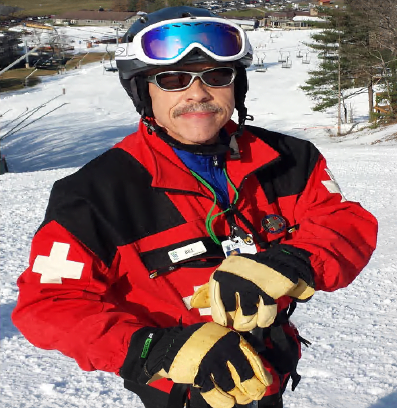 A native of Roanoke, he has been a member of a Ski Patrol nearly half of his time as a pastor. This story first appeared in the Mountain Courier paper (published in Woodstock, Virginia) for their December 2018 issue… and published here with permission. Previous articleSaturday…the One Yucky Day Left in January? Looks like it!